產品上架時間 2016 三月 02 週三. 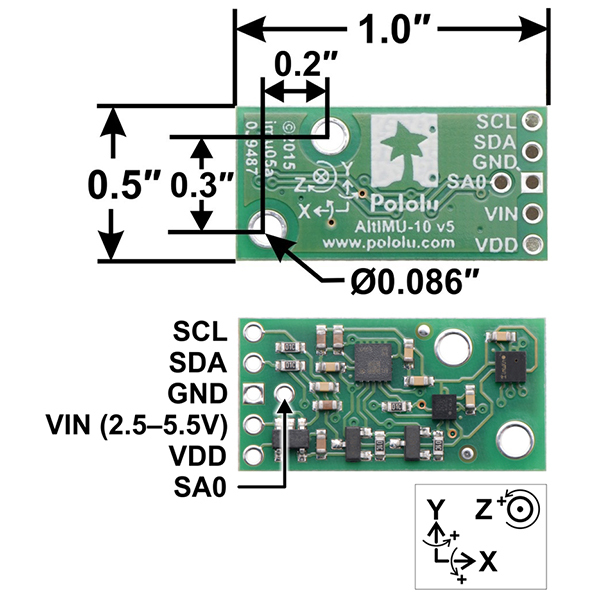 The Pololu AltIMU-10 v5 is a compact (1.0″ × 0.5″) board that combines ST’s LSM6DS33 3-axis gyroscope and 3-axis accelerometer, LIS3MDL 3-axis magnetometer, and LPS25H digital barometer to form an inertial measurement unit (IMU) and altimeter; we therefore recommend careful reading of the LSM6DS33 datasheet (1MB pdf), LIS3MDL datasheet (2MB pdf), andLPS25H datasheet (1MB pdf) before using this product. These sensors are great ICs, but their small packages make them difficult for the typical student or hobbyist to use. They also operate at voltages below 3.6 V, which can make interfacing difficult for microcontrollers operating at 5 V. The AltIMU-10 v5 addresses these issues by incorporating additional electronics, including a voltage regulator and a level-shifting circuit, while keeping the overall size as compact as possible. The board ships fully populated with its SMD components, including the LSM6DS33, LIS3MDL, and LPS25H, as shown in the product picture. Compared to the previous AltIMU-10 v4, the v5 version uses newer MEMS sensors that provide some increases in accuracy (lower noise and zero-rate offsets). The AltIMU-10 v5 is pin-compatible with the AltIMU-10 v4, but because it uses different sensor chips, software written for older IMU versions will need to be changed to work with the v5. The AltIMU-10 v5 is also pin-compatible with the MinIMU-9 v5 and offers the same functionality augmented by a digital barometer that can be used to obtain pressure and altitude measurements. It includes a second mounting hole and is only 0.2″ longer than the MinIMU-9 v5. Any code written for the MinIMU-9 v5 should also work with the AltIMU-10 v5. Side-by-side comparison of the MinIMU-9 v5 with the AltIMU-10 v5. The nine independent rotation, acceleration, and magnetic readings provide all the data needed to make an attitude and heading reference system (AHRS), and readings from the absolute pressure sensor can be easily converted to altitudes, giving you a total of ten independent measurements (sometimes called 10DOF). With an appropriate algorithm, a microcontroller or computer can use the data to calculate the orientation and height of the AltIMU board. The gyro can be used to very accurately track rotation on a short timescale, while the accelerometer and compass can help compensate for gyro drift over time by providing an absolute frame of reference. The respective axes of the two chips are aligned on the board to facilitate these sensor fusion calculations. 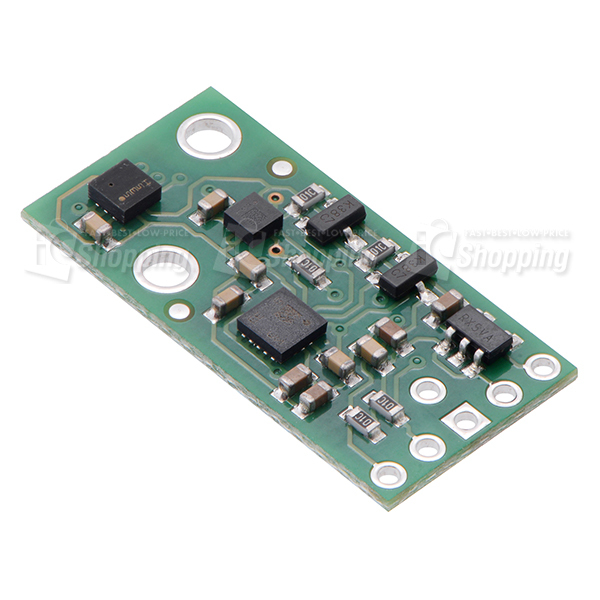 The carrier board includes a low-dropout linear voltage regulator that provides the 3.3 V required by the LSM6DS33, LIS3MDL, and LPS25H, allowing the module to be powered from a single 2.5 V to 5.5 V supply. The regulator output is available on the VDD pin and can supply almost 150 mA to external devices. The breakout board also includes a circuit that shifts the I²C clock and data lines to the same logic voltage level as the supplied VIN, making it simple to interface the board with 5 V systems. The board’s 0.1″ pin spacing makes it easy to use with standard solderless breadboards and 0.1″ perfboards. The ground (0 V) connection for your power supply. Your I²C control source must also share a common ground with this board. This is the main 2.5 V to 5.5 V power supply connection. The SCL and SDA level shifters pull the I²C bus high bits up to this level. 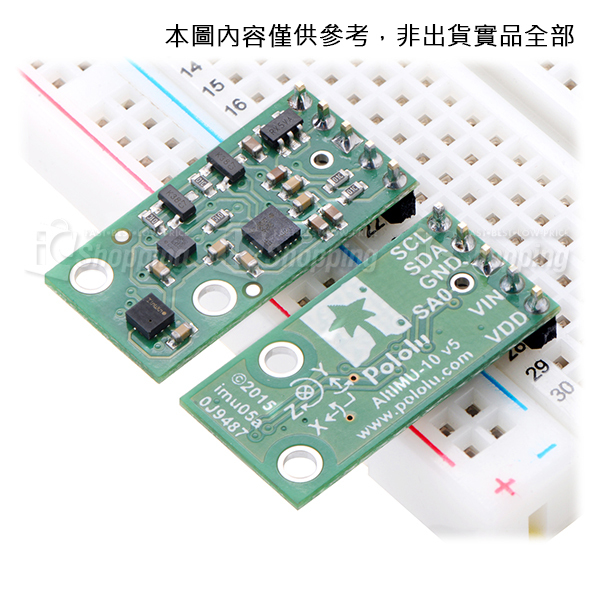 3.3 V regulator output or low-voltage logic power supply, depending on VIN. When VIN is supplied and greater than 3.3 V, VDD is a regulated 3.3 V output that can supply up to approximately 150 mA to external components. Alternatively, when interfacing with a 2.5 V to 3.3 V system, VIN can be left disconnected and power can be supplied directly to VDD. Never supply voltage to VDD when VIN is connected, and never supply more than 3.6 V to VDD. 3.3V-logic-level input to determine I²C slave addresses of the three ICs (see below). It is pulled high by default through 10 kΩ resistor. This pin is not level-shifted and is not 5V-tolerant. The CS, data ready, and interrupt pins of the LSM6DS33, LIS3MDL, and LPS25H are not accessible on the AltIMU-10 v5. In particular, the absence of the CS pin means that the optional SPI interface of these ICs is not available. 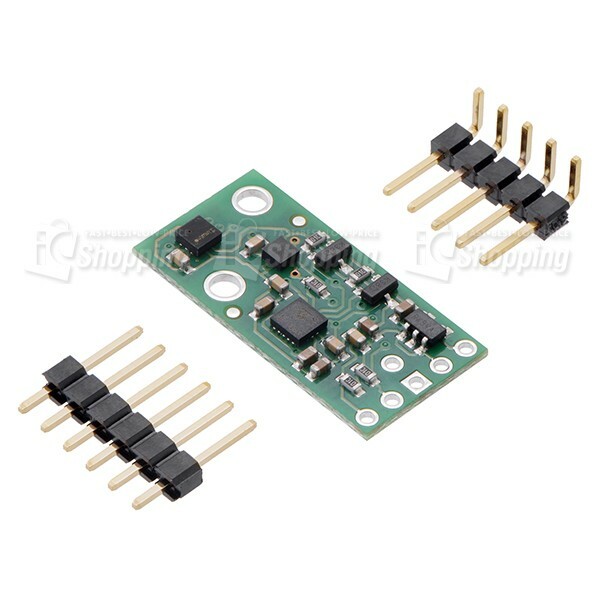 If you want these features, consider using our LSM6DS33 carrier, LIS3MDL carrier, and LPS25H carrier boards. The above schematic shows the additional components the carrier board incorporates to make the LSM6DS33, LIS3MDL, and LPS25H easier to use, including the voltage regulator that allows the board to be powered from a single 2.5 V to 5.5 V supply and the level-shifter circuit that allows for I²C communication at the same logic voltage level as VIN. 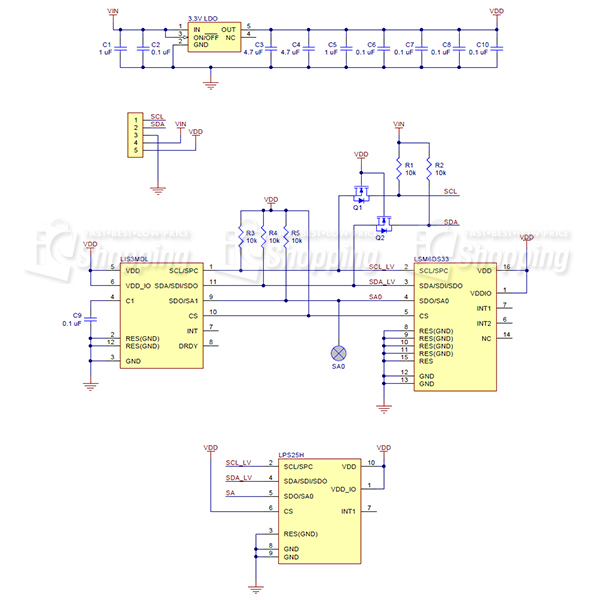 This schematic is also available as a downloadable pdf: AltIMU-10 v5 schematic (113k pdf). The LSM6DS33’s gyro and accelerometer, the LIS3MDL’s magnetometer, and the LPS25H’s barometer can be queried and configured through the I²C bus. Each of the four sensors acts as a slave device on the same I²C bus (i.e. their clock and data lines are tied together to ease communication). Additionally, level shifters on the I²C clock (SCL) and data lines (SDA) enable I²C communication with microcontrollers operating at the same voltage as VIN (2.5 V to 5.5 V). A detailed explanation of the protocols used by each device can be found in the LSM6DS33 datasheet (1MB pdf), the LIS3MDL datasheet (2MB pdf), and the LPS25H datasheet (1MB pdf). More detailed information about I²C in general can be found in NXP’s I²C-bus specification (371k pdf). All three chips on the AltIMU-10 v5 are compliant with fast mode (400 kHz) I²C standards as well as with the normal mode. We have written a basic LSM6DS33 Arduino library, LIS3MDL Arduino library, and LPS25H Arduino library that make it easy to interface the AltIMU-10 v5 with an Arduino or Arduino-compatible board like an A-Star. They also make it simple to configure the sensors and read the raw gyro, accelerometer, magnetometer, and pressure data. The gyro, accelerometer, magnetometer, and pressure sensor are all in power-down mode by default. You have to turn them on by setting the correct configuration registers. You can read or write multiple registers in the LIS3MDL or LPS25H with a single I²C command by asserting the most significant bit of the register address to enable address auto-increment. The register address in the LSM6DS33 automatically increments during a multiple byte access, allowing you to read or write multiple registers in a single I²C command. Unlike how some other ST sensors work, the auto-increment is enabled by default; you can turn it off with the IF_INC field in the CTRL3_C register. In addition to the datasheets, ST provides application notes for the LSM6DS33 (1MB pdf) and LIS3MDL (598k pdf) containing additional information and hints about using them.